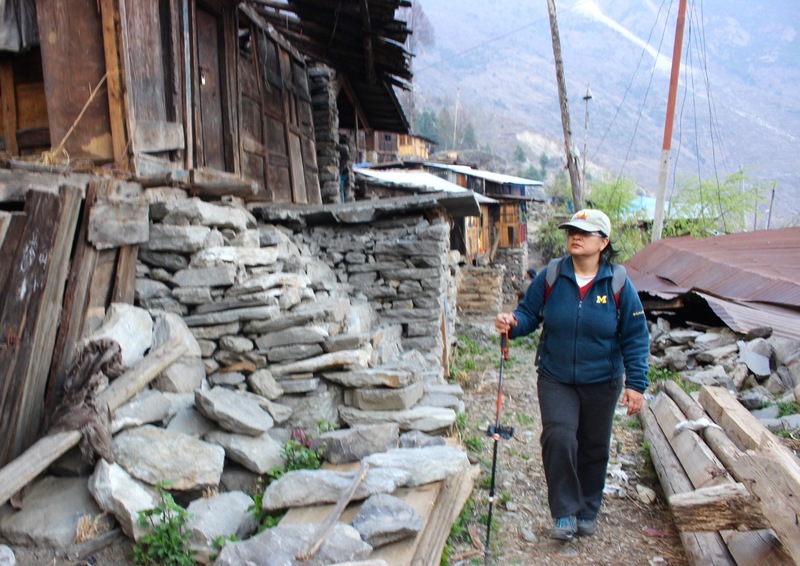 Dr. Meeta Pradhan surveying the damage in Haku Village, Rasuwa district, after the Nepal quakes of 2015. Photo by Ichchha Thapa. Dr. Meeta Sainju Pradhan served as Director of The Mountain Institute’s (TMI) Himalayan Program from 2014 to mid-2018. She is based in Kathmandu, Nepal. Dr. Pradhan started her career with TMI in 1991 as the Women’s Development Officer for the Makalu-Barun Conservation Project. This was an innovative initiative set up jointly by the Government of Nepal and TMI. By encouraging local people to participate, this project sought to achieve a balance between conserving and managing natural resources and addressing social, economic and cultural development. Dr. Pradhan was involved in supporting community-based entrepreneurship opportunities for rural women in eastern Nepal and focused on empowering women in all project activities. After her beginning with TMI, Dr. Pradhan went on to hold technical and senior management positions including Program Development Coordinator for CARE Nepal, and Assistant Monitoring and Evaluation Officer for UNICEF, Nepal. She was involved in research activities in areas of gender equality and social inclusion of marginalized caste and ethnic groups in Nepal, through secondary data analysis as well as program evaluations and monitoring. During her work with CARE, Nepal, she gained experience in managing multi-sectoral development programs in various parts of the country. Also at CARE Nepal, Dr. Pradhan lead technical teams in designing a wide range of programs and projects focusing on participatory watershed management, local governance of natural resources, women’s reproductive health and child health. All of these initiatives included elements of mainstreaming rights and responsibilities plus gender and social inclusion. She was also responsible for supporting diversity within the organization of CARE Nepal. She is currently engaged in research at the national level, focused on social inclusion. Dr. Pradhan holds a doctorate from the University of Michigan, USA concentrating on social exclusion and social change, examining the barriers that prevent local communities from fully participating in local development initiatives. She has experience in management, design, monitoring and evaluation of multi-sectoral development programs as well as research focusing on poverty alleviation, gender and social inclusion.